Sleep apnea is a disorder in which breathing stops and starts repeatedly throughout the night. 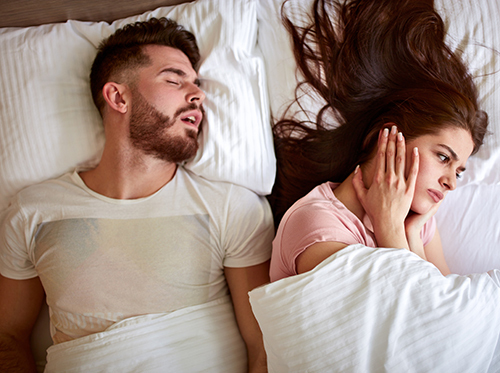 It’s most common among middle-aged adults, and the most prevalent symptom is loud snoring. Sleep apnea occurs when the muscles in the back of your throat relax to the point where they inhibit your natural breathing. It can cause your breathing to stop for anywhere from ten to twenty seconds. In the worst cases, it can even stop your breathing for up to a few minutes. In addition, people who suffer from sleep apnea wake up feeling tired and unrested. The condition may even lead to depression, high blood pressure, irritability, and memory loss. It puts you at a greater risk for heart attack and lowers oxygen levels in your brain. All of this sounds scary, but the good news is that sleep apnea can be treated! One of the most common ways Drs. Paul Jaworski and Benjamin Moricz can treat sleep apnea is by creating an oral device for you to wear while you sleep. The device brings your jaw forward, which keeps the airway open and lowers the incidence of snoring. Another method is to use a continuous positive airway mask, often referred to as a CPAP. The mask fits over the mouth and forces oxygen through the throat while you sleep. If you’re unsure about whether you may suffer from sleep apnea, visit our Sarasota, FL office and let Drs. Paul Jaworski and Benjamin Moricz know. We can determine the appropriate treatment if any is needed. Don’t risk losing another night’s sleep over something we can easily treat!